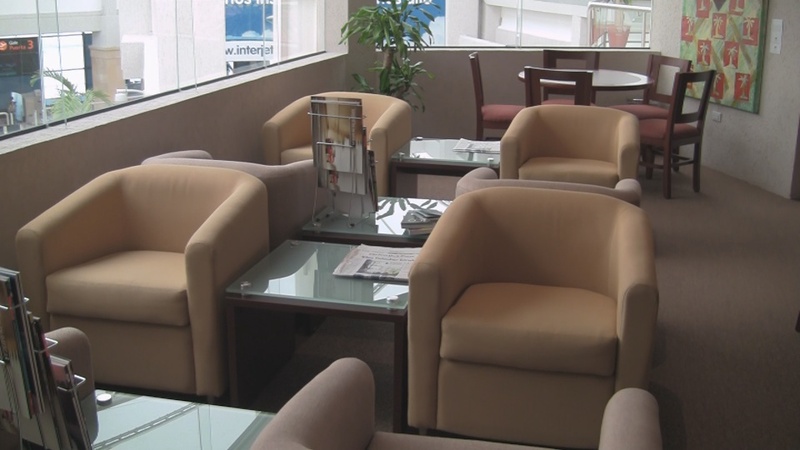 Small but comfortable VIP Lounge at Los Cabos Int’l. 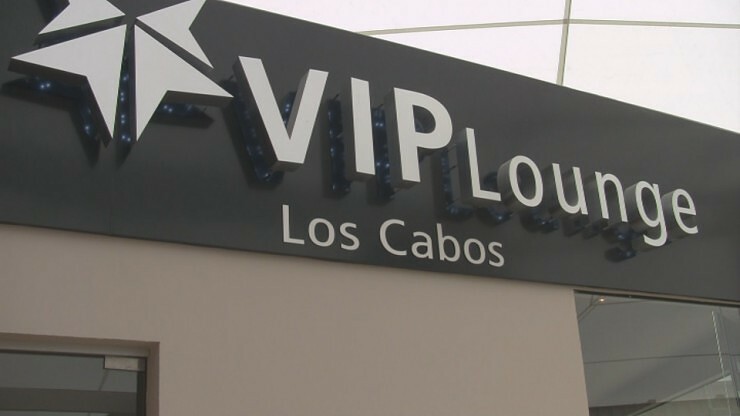 Notes: From others early looks at the VIP Lounge at Los Cabos Int’l, I got the impression that this lounge was sort of a joke. One of those 2-star lounges with the same snack mix they serve on the airplane, tiny wonder-bread finger sandwiches with the crust cut off and 2 bottles of self-serve booze. It’s not that bad. Sure, it isn’t huge, the decor is a little off and the selection of food wasn’t the best I’ve seen, but I was able to swiftly move in find a good spot to relax and grab a pretty reasonable snack . Okay, it WAS a mini-sandwich, but it was a served on a small-croissant (WAY fancier than wonder bread). The bar was surprisingly well stocked too with plenty of recommendations coming from the bartender. There are good spots to settle in here. The lounge chairs aren’t the most comfortable and those light colors will probably look worn within a few months or years of use but did the job. Table/chair cafe seating is scattered and there are even a couple of full living-room style sofa/love seat setups. The couches look a little weird in a small lounge, but I’m guessing it’s a good thing to have for families on their way out of town. Wi-Fi: Yes/Complimentary. Password available from the desk. Service: Drinks were offered and brought to us after we settled in. I’m not sure if that’s normal here or if it was just because we were the only ones here at the time. Both the front desk and bar/food staff were smiling and friendly. Convenience to gate: This is a small terminal so you’re never NOT close to your gate. Just around the corner and down the escalator and it’ll be a few steps from there. How I got in/Strategies: Priority Pass. If you’re not particularly loyal to a specific airline or don’t travel enough to justify the cost of a full lounge membership, I highly recommend joining. Plaza Premium Lounges in Canada offer their own yearly memberships or individual day passes (walk-up). Prices are very similar to what Priority Pass offers but only Plaza allows access to it’s own lounges, making Priority Pass the better value in that it gives you access to hundreds more clubs worldwide.